It is very important to the health of your lawn that you provide it with the care that it needs. Establishing a schedule of services to be performed is essential to your lawns health. Below is a general outline of services that should be completed and a general timeframe. All of these services can be performed by Grass Pro Lawn & Lanscaping. Ask for a free estimate today. As everyone is gearing up for spring, your lawn is ready to wake up. Along with your lawn grasses waking up so are perennial weeds. This is a perfect time to provide control. Herbicides should be applied at this time. Be sure your follow all directions for usage as not to damage your lawn. When you need help, be sure to contact us. We have a licensed commercial applicator that can provide that service for you. In addition to weed control, it is a good time to overseed thin spots in your lawn. It is also recommended that you have a soil test performed. Your lawn should be growing at a good pace during spring rains. Mowing should at least be a weekly event during this time. Never remove more than 1/3 of your leaf blade to ensure good health to your lawn. Watch for fungi and diseases at this time. If you suspect you have either be sure to contact us. If your thatch layer or soil is compacted, this would be an optimal time for spring aeration. Utilize a crabgrass preventer before April 15th. Here is your chance to take control of unsightly weeds. Apply postemergence herbicides for summer weeds, and apply fertilizer as indicated from your soil samples. Start a lookout for insect damage to your turf grass. If you notice damage, contact Grass Pro Lawn & Landscaping to apply chemical controls to your lawn. Begin watering your lawn at this time. Bluegrass turf requires about 1.2 inches of water weekly and Tall Fescue turf about .80 inches of water weekly. Water once a week if possible to a depth of six inches. Do not water daily or overwater. Water early in the day if possible to prevent fungal growth. Continue with watering schedule and mowing. If brown areas in turf are found check for white grubs. Apply grub insecticide if needed. Continue with watering schedule and mowing. 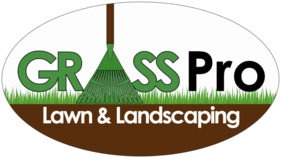 Call Grass Pro Lawn & Landscaping to schedule fall aeration and overseeding. Watch for renewed insect damage. At this time it is important to next years lawn success to aerate and overseed. Apply fertilizer and keep lawn watered at above recommended amounts. Herbicides can be used to control perennial broadleaf weeds. New grasses should be growing well. Continue to mow lawn as needed to maintain normal mowing height. Apply lime if indicated by soil test. Continue to mow until growth stops. Remove leaves from lawn as not to smother grasses out. Apply fertilizer as needed.